With Sarah Walker. Including Five Reasons to Love Bach at Christmas; Challenge: Mapping the Music; pianist Martha Argerich; Essential Choice: Beethoven: Piano Trio in D (Ghost). Discover definitive recordings of the greatest classical music with your trusted guide, Sarah Walker. 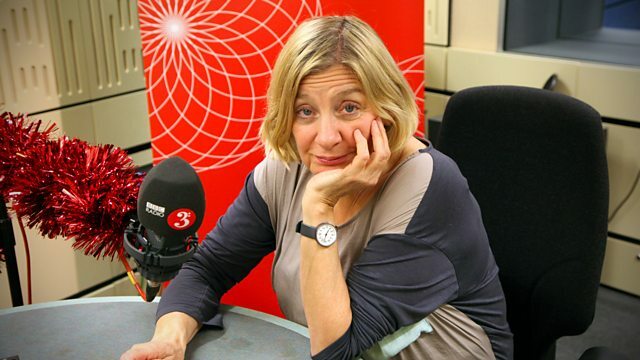 Her guest is the comedian, actress, writer and director Victoria Wood. A selection of music including '5 Reasons to Love... Bach at Christmas.' Sarah showcases choruses and arias from works composed by Bach especially for performance at Christmas, including Part II of the Christmas Oratorio and the opening chorus of Gelobet seist du, Jesu Christ, first performed by Bach in Leipzig on Christmas Day, 1724. Sarah's guest, sharing her favourite classical music every day at 10am, is one of the UK's best-loved writers and performers: the comedian and actress Victoria Wood. She also talks about the new musical TV adaptation of her stage play That Day We Sang, which will premiere on BBC Two over Christmas. This week's featured artist is the acclaimed Argentinian pianist Martha Argerich. Renowned for her individual virtuosity, Argerich is also known for her love of ensemble playing. Sarah showcases Argerich's solo recordings including works by Brahms, Ravel and Chopin and explores her collaborations with other musicians, highlighting Schubert's Arpeggione Sonata with cellist Mischa Maisky and Saint-Saens' Carnival of the Animals. As a festive treat, we'll also hear a playful two-piano arrangement of the Nutcracker Suite. Piano Trio in D major 'Ghost'. Conductor: Willi Boskovsky. Orchestra: Vienna Philharmonic. Johann Strauss: Waltzes, Polkas, Marches etc. : Weiner Philharmoniker, Boskovsky. Singer: Christoph Prégardien. Orchestra: Amsterdam Baroque Orchestra. Conductor: Ton Koopman. Choir: Amsterdam Baroque Choir. Singer: Klaus Mertens. Ensemble: Vertavo Quartet. Composer: Alexander Kopylov. Composer: Sokolov. Orchestra: Berlin Philharmonic. Conductor: Herbert von Karajan. Music Arranger: Sir Hamilton Harty. Choir: Manchester Children's Choir. Orchestra: Hallé. Conductor: Sir Hamilton Harty. Music Arranger: Christopher Palmer. Orchestra: BBC Philharmonic. Conductor: Rumon Gamba. Music Arranger: Jorge Calandrelli. Singer: Héctor Console. Performer: Leonardo Marconi. Performer: Antonio Agri. Performer: Horacio Malvicino. Performer: Yo‐Yo Ma. Performer: Néstor Marconi. Performer: Martha Argerich. Conductor: Claudio Abbado. Orchestra: BERLIN PHILHARMONIC ORCHESTRA. Performer: Andreas Staier. Performer: Daniel Sepec. Performer: Jean‐Guihen Queyras. Conductor: Vladimir Ashkenazy. Orchestra: Royal Philharmonic Orchestra. The place depicted was Arabia, and the music played was the Arabian Dance from Grieg's Peer Gynt.